Initial customers include Amazon Web Services, Vodafone, the American Samoa Telecommunications Authority (ASTCA) and Research and Education Advanced Network New Zealand (REANNZ). 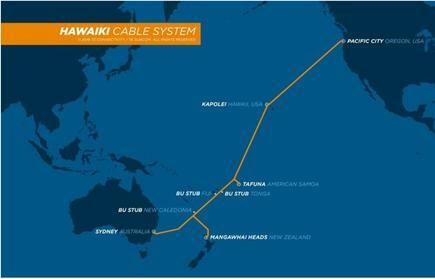 Hawaiki says its new cable will provide 43Tbps of capacity on the Australia-New Zealand-US route, several times the current available capacity — on a fully diverse route. Hawaiki says completion of the project is especially timely for South Pacific nations that are seeing demand for capacity growing by 45 per cent year-on-year. “Hawaiki has been specifically-designed to meet these expanding requirements, providing infrastructure to support critical applications such as business-grade cloud services, real-time content delivery and ultra-low latency networks,” it said. However only American Samoa is presently able to access the new cable system. Hawaiki said the new cable included several stubbed branching units to enable the future connection of New Caledonia, Fiji and Tonga. “American Samoa will be connected from day one, after celebrating the cable’s final landing in April this year,” the Hawaiki said. The governor of American Samoa, Lolo M. Moliga, described the new cable as “a game changer for the digital landscape in American Samoa,” that would have profound social and economic implications. Similar benefits might have accrued to Norfolk Island had the Australian Government responded to lobbying calling for it to come up with the A$30 million it would have cost to connect the island to the system.